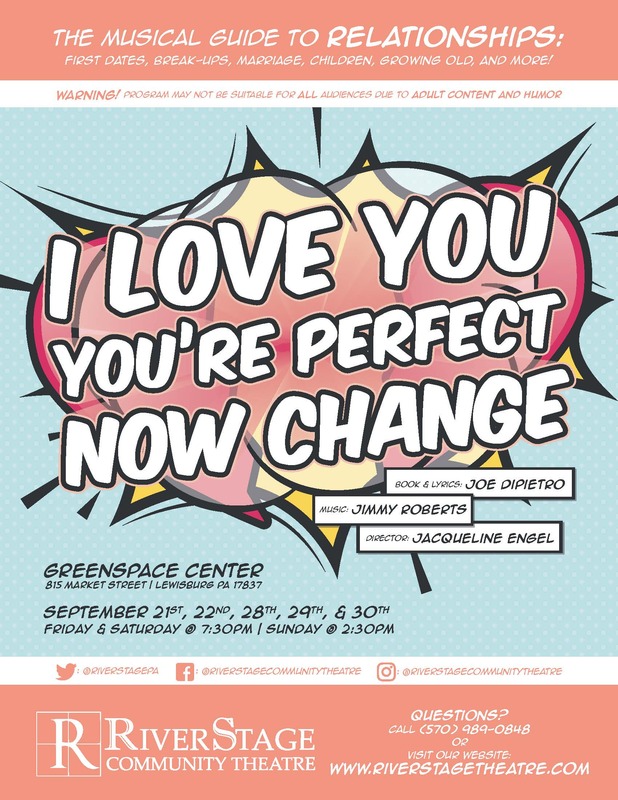 I LOVE YOU, YOU’RE PERFECT, NOW CHANGE by Joe DiPietro and Jimmy Roberts is the hit musical comedy about dating, romance, single life, marriage, and growing old, with eight cast members playing multiple characters as the different musical scenes unfold. Filled with funny, witty songs such as “He Called Me,” “Why? Cause I’m a Guy,” “Hey There, Single Gal,” and “Shouldn’t I Be Less in Love With You?” the show is the second-longest running Off-Broadway musical in history and nominated for the Outer Critics Circle Award. Because of adult situations and humor, the show is recommended for mature audiences only. 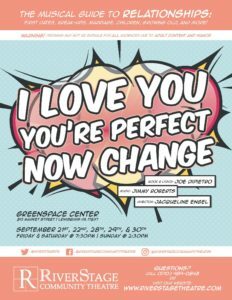 This production of I LOVE YOU, YOU’RE PERFECT, NOW CHANGE features a colorful cast of four men and four women who have appeared in productions with RiverStage, Community Theatre League, Courtyard Theatre, Pennsylvania Theatre of Performing Arts, and many others. Josh Adams, Steve Aguirre, Jove Graham and Glenn Wilson will play a wide range of boyfriends, husbands, kids, dads and lonely hearts, while Brandy Aguirre, Kathryn North, Amanda Rousu and Tara Wands will play the show’s complement of romance-seekers, wives, moms and other funny ladies. I LOVE YOU… is the first RiverStage musical directed by Engel, who spent the last decade as Artistic Director of the Community Theatre League in Williamsport and has directed more than 160 productions throughout central Pennsylvania. Buy Your 2018-19 Season Tickets Now!